GDI engines have no fuel injected onto the inlet side of the intake valve, therefore they lose the washing effect, which leads to tenacious deposit build up requiring preventative maintenance. GDI engines produce unburned fuel. This, along with increased compression and low-tension piston rings, causes more blow-by and deposit build up. GDI engine oil maintenance is a must. Blow-by of unburned fuel and combustion by-products into the crankcase can cause increased oil degradation, sludge, varnish, and carbon deposits. 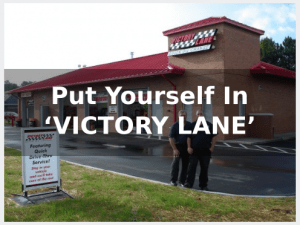 Using the correct recommended oil with Victory Lane’s GDI Fuel System Cleaning and Engine Treatment will help extend the life of your engine. GDI Fuel System Cleaner provides aggressive two-stage cleaning from the gas tank to the exhaust, dissolving gums, varnish and carbon deposits, and removing water from the fuel system, which fights ethanol problems. GDI Emissions Control System Cleaner cleans the PCV emissions system and intake valve deposits, dissolves crankcase sludge, varnish and carbon deposits, and improves oil drain. GDI Induction Cleaner aggressively cleans the intake system, intake valves, fuel injector tips, combustion chambers and exhaust systems. Two-stage cleaning formula reaches into the combustion chamber to dissolve injector tip deposits and knock-producing combustion chamber deposits. Maintain Now or Repair Later? “Problems can affect engine performance in as little as 3,000 miles. Neglected treatment may require a costly upper end teardown or vigorous mechanical cleaning to restore vitality.” * Victory Lane GDI Fuel System Cleaning may be recommended every 6,000 miles for preventative maintenance.